Walls are an ideal surface on which to apply acoustic products. Applying a sound absorbing wall layer to a large flat surface can resolve any number of acoustic problems in any type of room, especially where ceiling space cannot be utilised. Ceilings are usually busy places, with services such as fans, air conditioning units, lights and others services taking up the majority of space offered by ceilings. This means that ceilings are often tricky places to fit sound absorbers. The next logical step is acoustic wall panels. 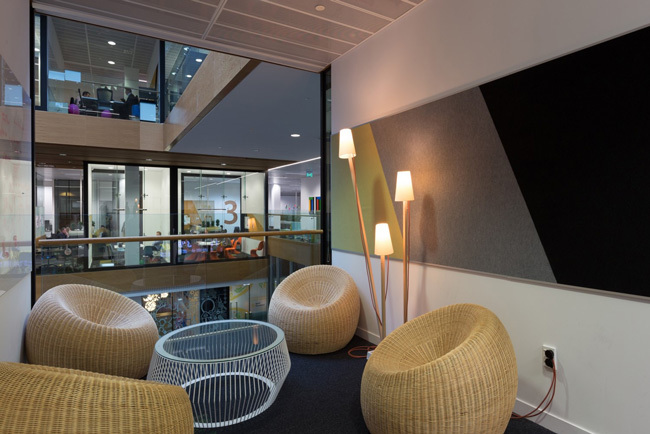 While acoustic wall panels are usually less effective sound absorbers than ceiling products, they have been given greater aesthetic consideration by manufacturers. 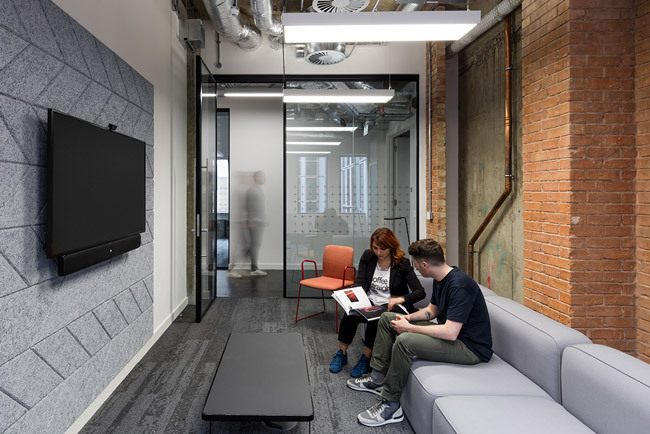 Wall panels can come as plain as you like, such as discreet solutions like Ecophon’s Akusto range, or more extravagant textured products such as Offecct’s Soundwave range and BAUX’s own wall tiles. Painted: Ecophon offer a painted surface finish that is similar to a plaster finish in its Akutek finish available across its range of wall solutions. Fabric: Fabric finishes are common across sound absorbing wall products. Our very own Fabric Wall solution allows you to choose from an endless range of acoustic fabrics stretched over a sound absorbing core. Other manufacturers including Ecophon and Buzzispace all have wall applications that have aesthetically-led fabric finishes. Wood: Swedish manufacturers BAUX wall tiles and panels are environmentally friendly acoustic solutions made from a combination of cement, wood and water. Impact Resistance: The benefit of wall solutions is that the extra support afforded by a direct fixing and robust panel design that can give full impact resistance. Ecophon’s Super G, and our very own Fabric Wall panels, both offer impact resistance to EN 13964 Standards. User Installation: A number of manufacturers have created panels specifically for user installation. BAUX’s acoustic tiles and Offecct’s Soundwave range offer simple installation methods that give users the opportunity to create their own wall designs. Printability: Wall solutions are ideal for branding and artwork printing. Our Print Wall system allows you to combine sound absorption and eye catching artwork. Ecophon’s Super G is also perfect for digital printing. 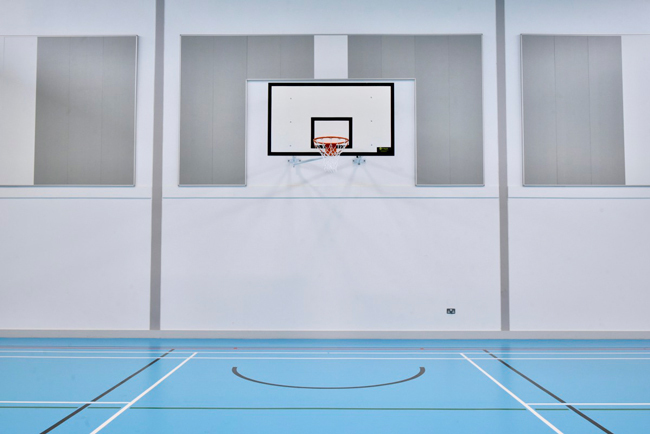 We provide free quotations for the supply and installation across our acoustic panel range. Get in contact for a budget quotation and design for any solution.